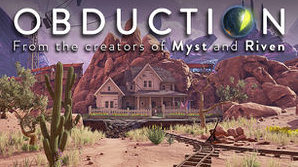 Obduction is considered a spiritual successor to Cyan’s previous adventure games, Myst and Riven. In the game, the player finds their character transported to strange alien worlds but with human elements within the settings. The player must explore and solve puzzles to figure out how to return home. As you walk beside the lake on a cloudy night, a distant thunderclap demands your attention. A curious, organic artifact falls from the starry sky and inexplicably, without asking permission, transports you across the universe. a white picket fence, and a rather bizarre little ghost town – well… almost ghost town. Adding to the oddity, you discover a strangely kluged kiosk that reassuringly welcomes you to Hunrath. The new worlds of Obduction reveal their secrets only as you explore, coax, and consider them. And as you bask in the otherworldly beauty and explore through the enigmatic landscapes, remember that the choices you make will have substantial consequences.